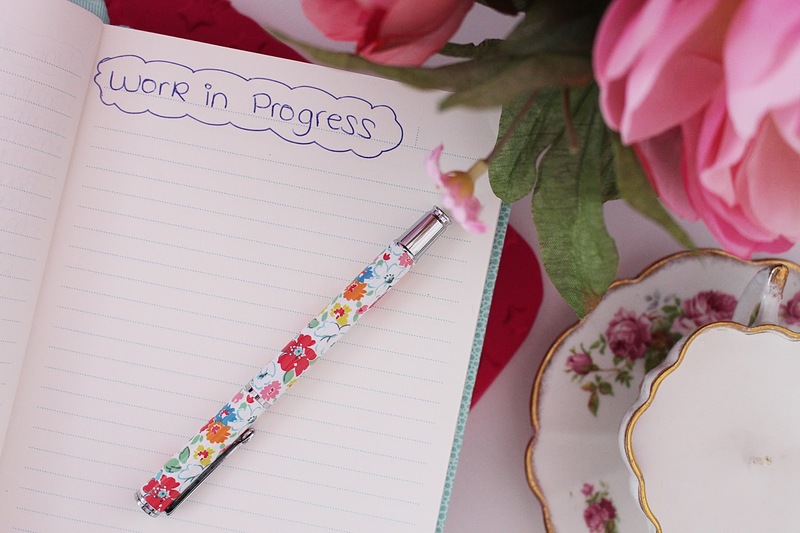 Do you ever feel a bit like a 'work in progress'? Lately I've been feeling like this a lot. Whilst I'm happy about several aspects of my life, there are still a lot of things I want to improve, and I feel like I'll never be truly happy until I do. Every night, before I go to sleep, I lie in bed and think about my 'perfect' life. I think about how I'll have the perfect figure, a nice house, a good job (preferably blogging full-time), a successful novel in the pipeline and my boyfriend and my dog by my side. Of course, the house is decked out with florals, Cath Kidston, all the pastel crockery you can imagine and snazzy appliances like KitchenAids and Roberts Radios. I'll have my own personal office, complete with iMac (which I thankfully already have), bookcase full of inspirational stories and my very own physical Pinterest board hanging on the wall. I'll go travelling thanks to my blog and I'll be able to afford holidays of my own, several times a year. I'll be able to travel to London regularly for events, and spend more time working with brands and bloggers I love. A lot to ask, right? Probably, but I can't help hold onto the dream. And whilst it pushes me to persevere, it also leaves me feeling really depressed. I feel like my dream is unrealistic and it'll never come true, and I'll never have that feeling of 'content' that I'm so desperate for. You see, that's the thing that I'm really lusting after. Forget the house and the office and the holidays - what I really want is to feel at peace with myself and content with my life. Right now I don't feel like that. I feel a bit stuck, very lost, and, more than anything, terrified about where my life is going. After university I expected I'd land my dream job, move to London and live happily ever after. However, things change. Plans change and life doesn't always work out the way you want it to. Jobs are ridiculously hard to get, and after graduating you are literally thrown into the scary 'real world' and forced to scramble for a job - any job. But even then jobs are hard to find, and I think we're left with a generation of lost souls wondering what will become of them. I'm worried that I won't achieve half the things I wanted to. I'm frightened that because I'm holding on to the dream of blogging full-time, I'm missing out on other opportunities and making a career for myself elsewhere. I'm terrified that I'll look back on my life and feel overwhelmed with regret, and I feel like I need to stop dreaming and start living. But it's not always that easy, is it?